The rule clarifies how organic producers and handlers must treat their animals, brings clarity to the existing USDA organic regulations, and adds new requirements for organic livestock and poultry living conditions, transport, and slaughter practices. For example, the rule establishes minimum indoor and outdoor space requirements for organic chickens, clarifies that outdoor spaces must include soil and vegetation, adds humane handling requirements, and clarifies humane slaughter requirements. The final rule is based on extensive input from the organic community and stakeholders. It’s consistent with direction from Congress in the Organic Foods Production Act, which provides USDA the authority to develop regulations to ensure consumers that organic products meet a consistent standard. This includes developing detailed standards for organic livestock and poultry production. The rule supports this core goal of the OFPA. The regulations that created the National Organic Program also explained that USDA would develop species-specific guidelines and space requirements for organic animals. Additionally, the National Organic Standards Board (NOSB), a 15-member advisory committee that represents all sectors of the organic community, made a number of recommendations that were vital to the development of the rule. There are three stages to implementing the rule. Within one year, all provisions – except for outdoor access requirements for layers and indoor space requirements for broilers – must be implemented. Within three years, organic broiler operations must comply with the indoor space requirements. 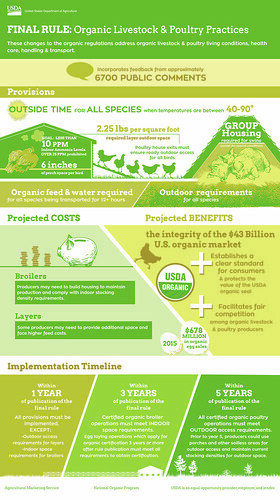 Within five years, all organic poultry operations must comply with the outdoor access requirements. Most organic livestock and poultry producers already comply with the new requirements. In fact, many producers use multiple certifications to demonstrate their animal health and welfare practices to consumers. This rule could make additional animal health and welfare certifications unnecessary, reducing the burden on organic producers. USDA offers assistance programs and services to assist producers who need to modify their operations in response to these changes. From conservation financial and technical assistance from USDA’s Natural Resources Conservation Service to loans for equipment and purchases from USDA’s Farm Service Agency, we are here to help. For a comprehensive list of resources available, visit Technical and Financial Assistance for Organic Producers. You may also visit www.usda.gov/organic to learn more about USDA’s programs and services tailored to meet the needs of the organic sector. USDA is committed to supporting the continued growth of the organic livestock and poultry sector, and ensuring consumer confidence in the organic market, which in 2015 was worth over $43 billion in the U.S. alone. To build on this support, it has been a top priority to strengthen standards for organic livestock and poultry, ensuring that we meet consumer expectations and maintain the integrity of the USDA organic seal. You can learn more about the final rule on our website. I am based in Zambia.I am looking for funding in poultry for expansion. Can be very happy if considered. kindly,assist as soon as possible because there is great opportunity in the industry here. Why do you make more rules when the rules now are not inforced.dairys feeds conventional feed and sales his milk organic a dairy feeds conventional silage and sell there milk organic a dairy buys conventional heifers worms them brand them and milk them organic the same day a lot of organic dairy don't graze there cows and sell there milk organic dairy's that treat there con with conventional drugs and sell there milk organic some of the milk company know they cheat and keep useing the milk organic.and then the milk plants mix up of conventional and organic.it makes me sick.